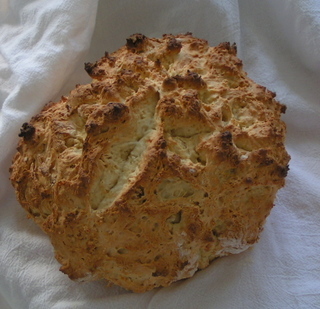 Irish Soda Bread - Where's the Pop? Doesn't this look fabulous? It was! Very dense and moist with a great crust. This recipe is from A Little Irish Cookbook from Appletree Press. I made it for our delayed St Patrick's Day Celebration at my Mom and Dad's house on Sunday. This recipe is a keeper! I've added my comments with brackets. Sieve the dry ingredients into a large bowl. Scoop up handfuls and allow to drop back into the bowl to aerate the mixture. Add enough buttermilk to make a soft dough [I used about 1 3/4 cups]. Now work quickly as the buttermilk and soda are already reacting. Knead the dough lightly - too much handling will toughen it, while too little means it won't rise properly. Form a round loaf about as thick as your fist [if your fist is as big as the jolly green giants--this was about the size of 4 of my fists]. Place it on a lightly-floured baking sheet and cut a cross in the top with a floured knife. Put at once to bake near the top of a pre-heated oven, 450°F, for 30-45 minutes [30 minutes]. When baked, the loaf will sound hollow when rapped on the bottom with your knuckles. Wrap immediately in a clean tea-towel to stop the crust hardening too much. I actually put my pot in for the No Knead Bread while I was cooking this so I could pop my third load in. Hi! Thanks for your comment on my blog! Yes, my recipe for soda bread is sweet, but when my children were young they loved it that way. I'll try your recipe too -- your loaf came out beautiful!